Slow Cooker Tortilla Soup, ladled over the tortilla chips, and garnished with queso fresco and cilantro. 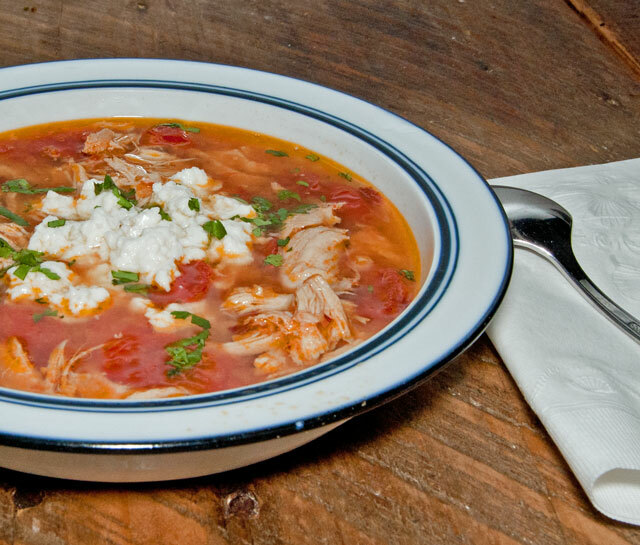 Slow Cooker Tortilla Soup, ladled over the tortilla chips, and garnished with queso fresco and cilantro, is amazing! A. Ma. Zing. I am totally going to be adding this to our fall/winter go-to recipes. So much comfort on a cold evening. Pin this on Pinterest. It takes a little prep work, but it’s all on the front end. One of my friends was worrying about the Cook’s Illustrated Slow Cooker Revolution book. She said that she had heard that with many of the recipes, you had to do steps all day long, and she didn’t have time for that. Well, that may be so on a few of their recipes, but definitely not with this one. 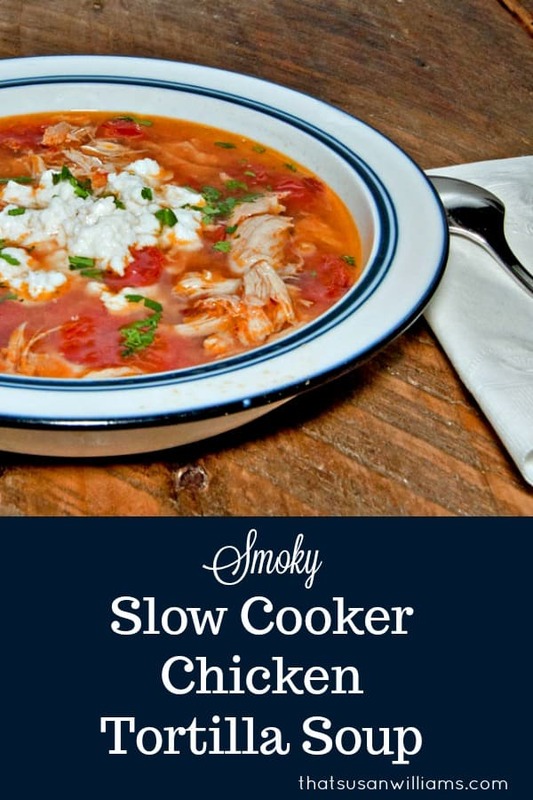 And just in case you didn’t make the connection, yes, this recipe DID come from the America’s Test Kitchen Slow Cooker Revolution Cookbook. You’ll see it linked over in my sidebar, with some of my favorite cookbooks. Friends, I am telling you, you really NEED this cookbook. Since I have tried this particular recipe, I’m going to share with you my frugal tips that will help you save a little money, because not wasting food is important, not only at my house, but for the planet as well. Wasted food is wasted money, and every little bit helps. Tip #1: This recipe calls for one tablespoon of tomato paste. Don’t you just hate to open up one of those cans of tomato paste, only use a little bit, and have to either throw the can out, or have the remains rot in your fridge? Here’s my tip: of course, you could always buy tomato paste in a tube, if you can find it (it’s usually in the Italian section of my grocery store), but that’s a bit more of an expensive way to do it. Here’s what I do. Spread out a sheet of wax paper or parchment paper on a cookie sheet. Dollop approximate 1 tablespoonful of tomato paste globs on it. You can be exact on the first one, and eyeball the rest. Stick it in the freezer for an hour or so, as is, to firm up. (Don’t forget about it!) Then cut those portions into squares (I just leave it on the wax paper: that’s fine. It peels off). And label your zip lock bag “Tomato Paste”. And now you have 1 T. blobs of tomato paste, pre-measured and handy, in your freezer. No waste, and convenience in the future! Yay! Tip #2: Do the same thing with canned chipotle chiles in adobo sauce. I don’t know about you, but 3 or 4 times a year, I run into a recipe that calls for these hot, sweet, smoky little gems that are just PACKED with flavor and aroma. They really are an integral part of whatever recipe you have that calls for them. Don’t leave them out because they’re an obscure ingredient to you: they make all the difference. I find them in the Latino section of my grocery store, or with the Mexican foods. So, if you are buying these for the first time, open the can, use what you need for the recipe you are making, and then freeze them on wax paper on a cookie sheet and store them in a ziplock bag labeled chipotle peppers. You will be so glad you have these. They are powerhouses of flavor. Even if they’re still frozen when you take them from the freezer, they’re almost easier to mince in the frozen state. Tip #3: Save every chicken bone/turkey bone that comes your way, in a bag, in the freezer. (I also save the hearts and necks that come inside the chicken or turkey as well.) When you accumulate enough, make your own Homemade Chicken Stock. Click that link to read my recipe: its fantastic, with a spice you may not have thought of adding, that brings great flavor and aroma! Homemade Chicken or Turkey Stock is so much better than store bought. I made this tortilla soup out of part stock from a box that I bought at Costco, but part homemade turkey stock that I had frozen in the freezer, awaiting my next momentous soup occasion. Man, there’s nothing like your own stock to pack flavor into a soup. And, it’s a thriftier way to do it. This recipe calls for 8 cups of chicken broth. That’s two boxes. So, I ended up using one box, and one frozen container of my own stock, and felt virtuous knowing that all those bones had brought real life and flavor to my tortilla soup. Tip #4: Call me a lightweight, but I don’t think this soup needs all the chipotle and jalapeño peppers that the original recipe calls for. Therefore, my version of this recipe has less jalapeño, and less chipotle. Basically, I minced only one jalapeño (their recipe called for two), and the fresh uncooked stuff that they wanted me to add at the end, and let sit for 5 minutes before serving? I didn’t. So, adjust this to your family’s taste. If you taste the soup at the end, and you like more heat, add another teaspoon of minced jalapeño, of minced chipotle, and check to see if you want to add any salt or pepper, and then let the soup sit for 5 minutes while your additional peppers warm up. Mine didn’t need one. single. bit. of anything else added. Tip #5: Since the onion needed to be minced, which means very finely chopped, I quartered it, and then pulsed it in the food processor till I reached the fineness I liked. If you run the food processor rather than pulsing it, you’re more likely to end up with an onion moosh, which you don’t want. I minced the jalapeño by hand WEARING DISPOSABLE GLOVES, but then added those bits to the onions I had pulsed. The original recipe called for 6 garlic cloves, but I added much more. How bad can a lot of garlic be, after all? Without further ado, here’s the wonderful recipe for soup. I think you (and your family)will LOVE it! Slow Cooker Tortilla Soup is a delicious soup that you can make in your slow cooker, flavored with smoky chipotle peppers. Ladle over tortilla chips. Heat oil in 12-inch skillet over medium-high heat until shimmering. Add tomatoes, onion, and jalapeño and cook until onion is softened and browned, 8 to 10 minutes. Stir in garlic, chipotles, and tomato paste and cook until fragrant, about 30 seconds. Stir in 1 c. broth, scraping up any browned bits; transfer to slow cooker. Transfer chicken to cutting board, let cool slightly, then shred into bite-size pieces. Let soup settle for 5 minutes, then remove fat from surface using large spoon. Discard cilantro stems. Stir in shredded chicken, and let sit until heated through, about 5 minutes. Add any additional seasonings (chipotle or jalapeño peppers, or salt and pepper) according to your taste, at this point. Place tortilla chips in serving bowls, ladle soup over top, and serve with cheese, avocado, sour cream, cilantro, and lime wedges.